The endurance shuttle walk test (ESWT) is a constant-load exercise test which measures the ability of the participant to sustain a given sub-maximal exercise capacity. The ESWT speed is calculated based on the protocol developed by (Revill, et al., 1999)9 ,(Hill, et al., 2012)10 and (Wootton, et al., 2014)11 and is performed according to the original protocol. 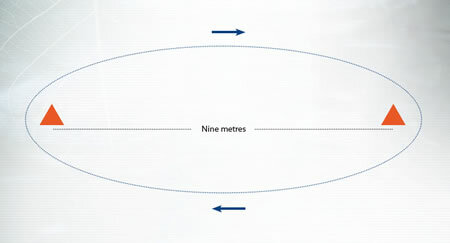 Two ESWTs are performed to account for any learning effect.9 The endpoint of the test is how long the participant walks at the constant endurance speed. The test consists of 8 tapes (or 8 tracks on CD’s) pre-recorded with a signal at different frequencies giving a total of 16 walking speeds. The participant is asked to walk up and down a 10m course. Two cones are set 0.5m from either end to avoid sudden change in direction (figure 1). At the start of each test there is a slower ‘warm up’ speed which lasts for 90 seconds. At the end of the warm up a message instructs the participant to increase their walking speed at the next signal. It is recommended that the tester reinforces this message to the participant. Record BP, HR, SpO2 and BORG (breathlessness) at the start. Count the first shuttle the participant passed (even if they did not make it) as the final distance but do not count the very last shuttle that was missed. At the end of the test, record HR, SpO2, BORG (breathlessness), RPE (effort), and reason for termination test.